Prepared by Ian Smith, 25th May 2010. 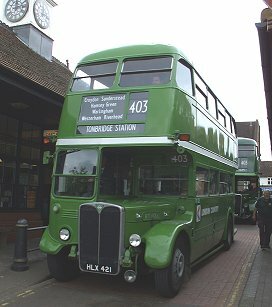 MB90 came into the bus station to load for the 454 to Chipstead. The crowd seemed enormous, and I did not expect to get a good seat. 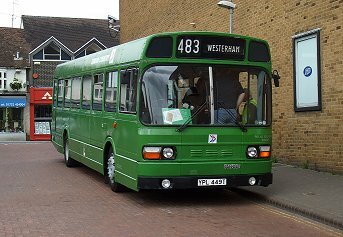 I went to photograph Leyland National SNB449 instead: it was waiting on the top of the bus station for a slot to load for the 483 to Westerham. It was passed by Dart SLF 3179 easing into the bus station to take up service on the 401. 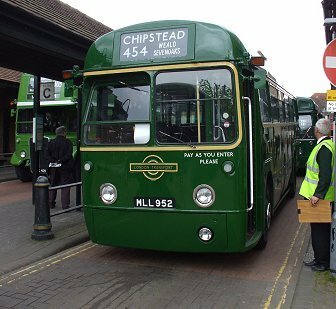 This Dart SLF has a fascinating history: it started with Maidstone & District, then transferred to Arriva Kent Thameside at Dartford. There it turned red, for use on the 428. 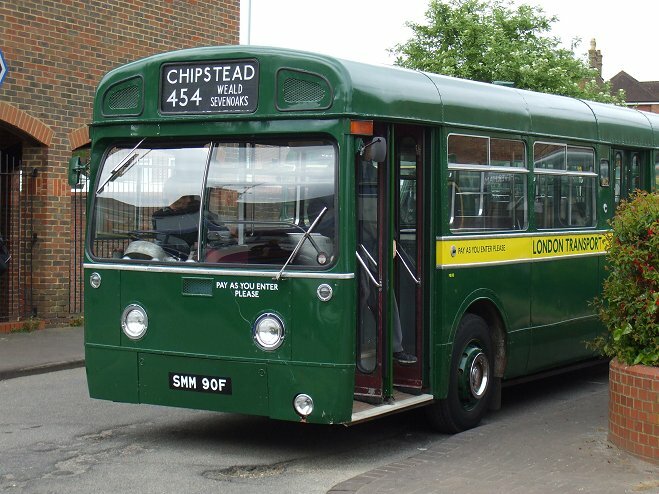 It was displaced by newer Darts in 2007, and spent a while oscillating between Dartford and Grays as needs arose. 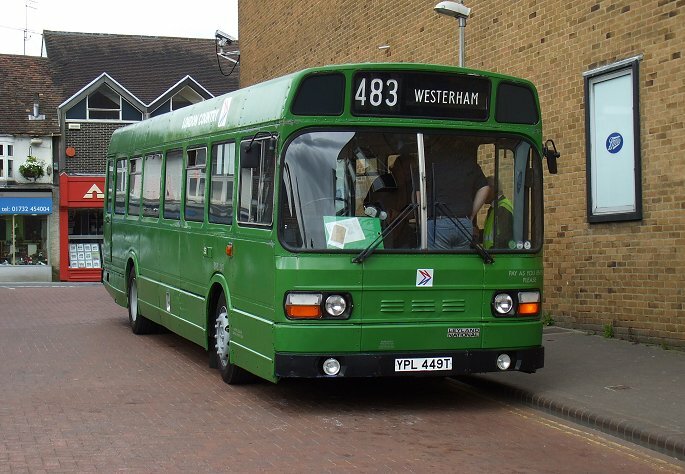 Then it went to Horsham, to be the red spare on the 465. 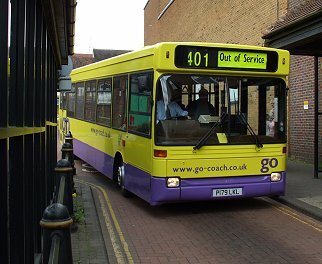 Metrobus took it over in September 2009, and promptly sold it to Go-Coach at Knockholt Pound, who had won the 401 and 421 routes under Kent tender. 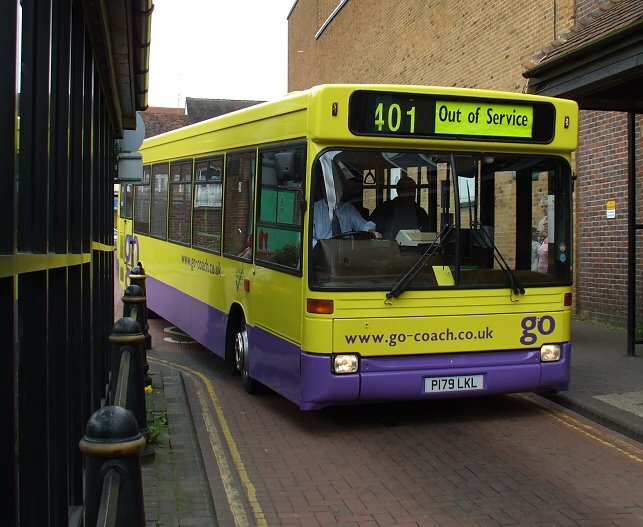 They painted it in their yellow and mauve livery. 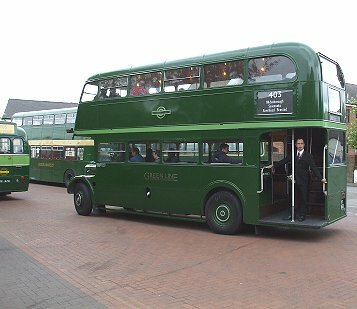 MB90 swallowed its queue, and when I poked my nose in through the door there was a seat right at the front! I boarded properly and took my seat, looking out through the big front window. 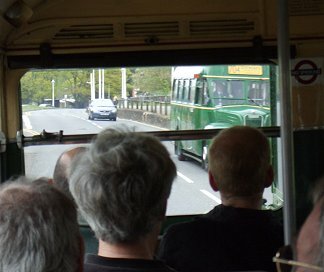 We set off through Sevenoaks, and took the route west past the War Memorial, motoring heartily down through St.Johns to Bat and Ball. There we turned left to run along the A25 to Riverhead and under the railway bridge. We negotiated the road junction with the old A21, scene of so much delay in the days before the M25 and A21 by-pass took the cars elswhere. 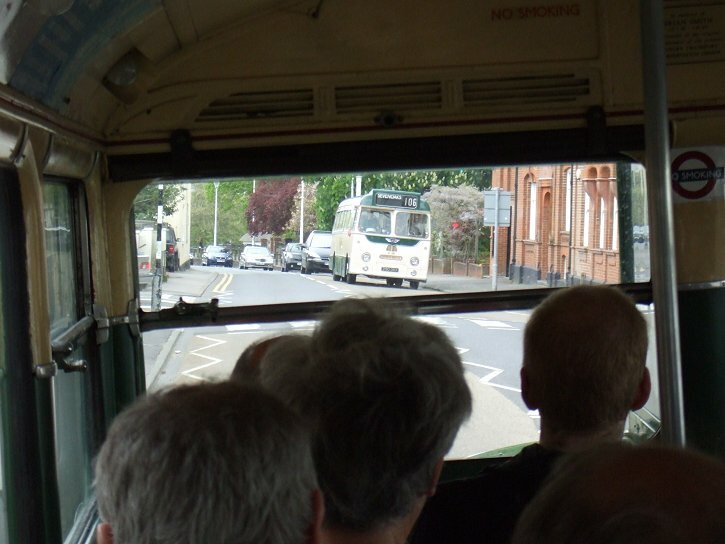 We climbed up towards Bessels Green on the A25, the big engine at the back making lovely noises. 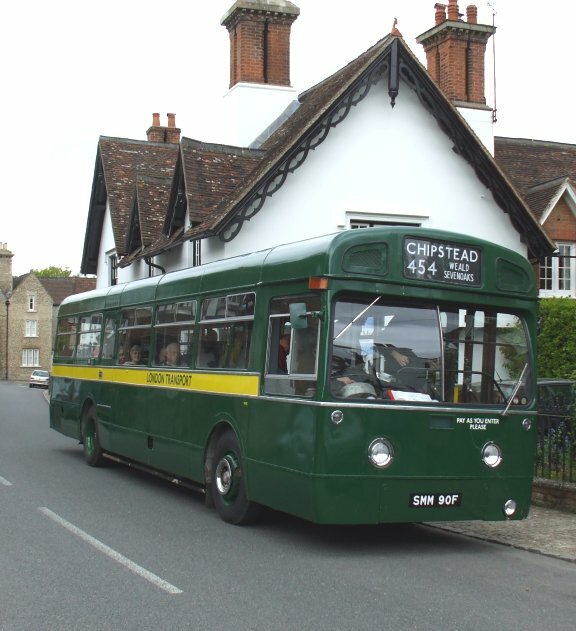 We turned right into the far end of Chipstead, and carefully negotiated the narrow village street to pull up at a wider point, the old terminus. 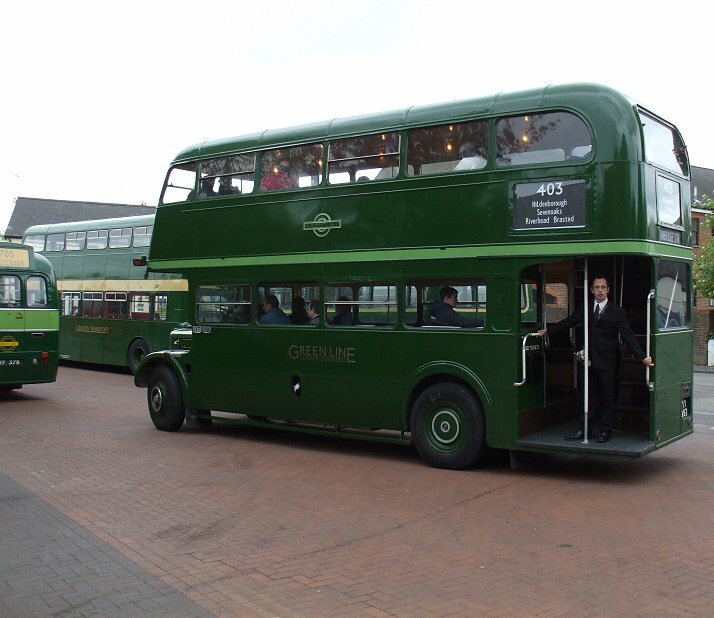 Many photos were taken, and the blinds were wound for the journey back through Sevenoaks and on to Tonbridge. 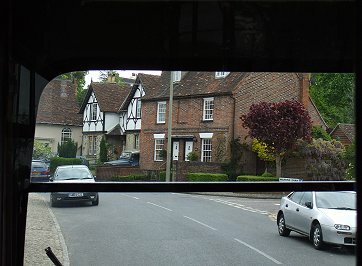 Once we were all back aboard we continued through the village, to turn right along Witches Lane (the old route direct to Riverhead being now too narrow). 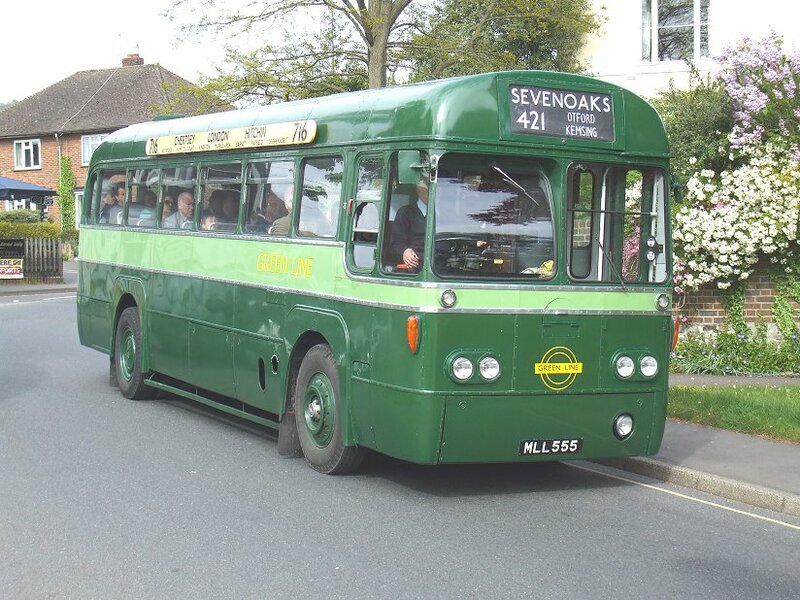 We regained the A25, and worked our way back to Bat and Ball, and back up the long hill to Sevenoaks. At the bus station RT3228 was just leaving on a 403 to Tonbridge, and RT604 was loading for the 403 west to Westerham. 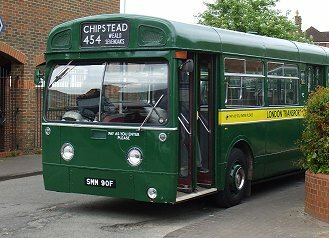 Ahead of MB90 stood RF315, loading for the next 454 run to Chipstead. I climbed aboard RT604, which was already well loaded. So I did not get my preferred seat, but still had a view forward through the front downstairs window. We were immediately away, and turned right to run along to the War Memorial. 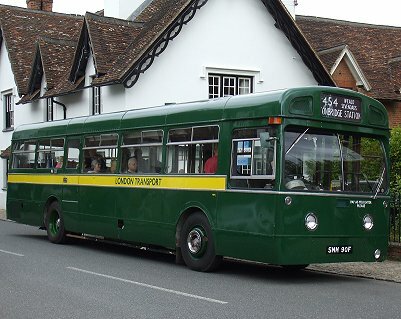 On the way we met SC390, running in after a foray on the 106 to Fawke Common and back, and then GS62, operating an extra on the 704, a short journey to and from Dunton Green. Approaching St.Botolph's Drive our driver went to turn left down it, then changed his mind (Perhaps the trees looke too threatening, although they pose no problem in practice). Having passed the turn, he was mindful to turn back. But it was suggested that he continued down to Bat and Ball, and rejoin the route at Riverhead. A navigator who knew the way was needed, and I volunteered, taking up a seat behind the driver. We continued down the long hill through St.John's to Bat and Ball, where we turned left. I reassured the driver that the railway bridge was high enough for RTs (it is plated at 14ft 9in). We duly passed under with no problem and negotiated the two roundabouts at Riverhead onto the westward A25. 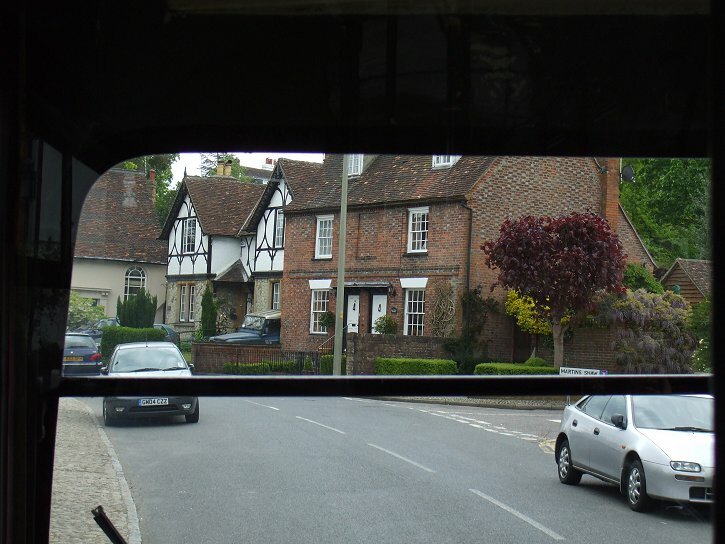 I settled back into my earlier seat for the ride west through Bessels Green, Sundridge and Brasted, at none of which was there a safe place to stop for photos. But at Westerham we pulled up at the stop by the Kings Arms, and photos were duly taken. The bus continued out onto the Chelsham Road to reach the turning point, which required a three point turn by the RT. 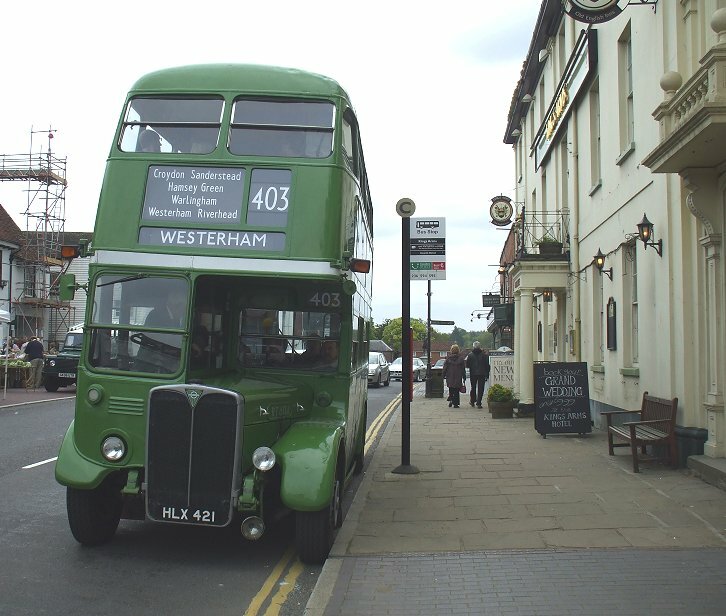 Then it was back to Westerham. The bus stop opposite the Kings Arms was blocked by a Sunday market, so we continued over the junction with the old Bromley Road to the stop on the Green, where we picked up a few folk who had wanted five minutes in Westerham. The return ride to Sevenoaks was uneventful: we trundled eastwards along the valley road. Even the speed reminder signs at the edge of villages went quiet as we approached. 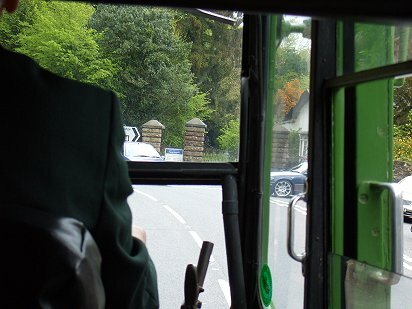 I sat back behind the driver and just enjoyed the ride through wonderful Kent spring scenery. At Riverhead we took the turn to Tubs Hill Station, and climbed the wonderful tree-lined St.Botolphs Drive up the hill to the War Memorial, before trundling along through the top of the town to the bus station. 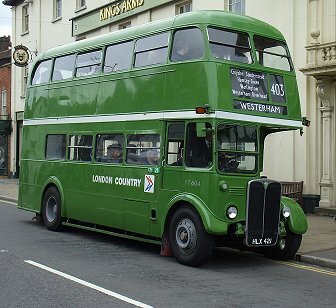 The Maidstone & District Bristol was resting between turns: could I wangle a ride?